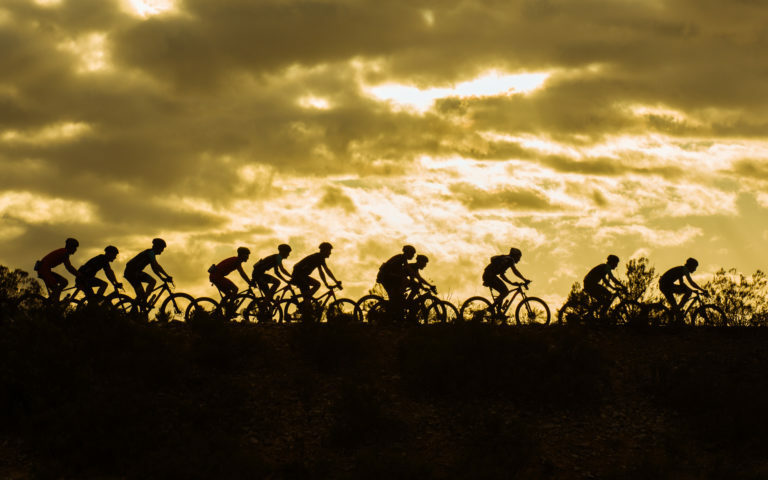 The continuation of the adventure to actually get on the start line of the Cape Epic 2018. You will remember the big challenges of my injury and then Jennie having to put out of the race with a very bad hamstring tear. So, with a new race partner, we made it to the start. For once I was very nervous before starting the Cape Epic. I did not feel bad, but my heart was racing! Finally, the start, that went pretty well and we made good progress. Angi said we kick out a lot of power and make many watts! It went well, but after about 8km my legs suddenly closed, and I struggled to keep up the pace. Angi took over the leadership and I hung on her rear wheel. Strangely, Jennie who was commentating for the race said the Prologue wasn’t my favourite thing and I would do better on the longer stages with more climbing. She wasn’t wrong! The slightly longer ascent up to the road was then quite steep, I had to come back to „Full force „. I was very happy that Angi took over the lead on the street. We certainly lost a little time, but we were still on the way. Then a little later in downhill I was a bit stronger than Angi and I took some speed out, dropping the pace. I did not want to stress, because that brings us nothing. Finally, we drove over the finish line in less than an hour. Since they already said who, 1st ; 2nd and 3rd were, I knew that our time was not quite as good. The fact we had lost so much time surprised me then I realised something! I knew Langvad would be fast, but I expected the performance of some other teams to be better, I was surprised, because we were not slow in comparison to others! The cooperation with Angi worked quite well and I think we will have a good week together. I’m looking forward to more! After the doping inspection, which lasted a bit longer than expected, we finally drove by car to Robertson, where we will be for the next three nights. The house is really nice and I hope for a good day tomorrow. Today for my birthday, we wanted to attack. We liked the the stage profile, agreed and we felt good! In addition, we had to start the race to catch up. The first 20km went fast but not too fast. Mostly on asphalt or gravel …. soon we caught and held on the wheel of starting Block B, then passed them all. The passed us again but as soon as they were in front of us, they dropped their legs and we (women) overtook them again. Because we must not ride in the slipstream of the men the reverse would also apply! Soon it was now in the jeep track / singletrack and then it was really hectic! The two fields mingled and it was not easy for each to hold their own. I saw that we did not lose the connection and Angi followed on my rear wheel! Perfect! The legs were good, everything was still right! But only a little later, I heard Angi crashing behind me and stopped immediately to help her. But she had dislocated her shoulder during the fall so that it was not possible to drive on! S****** ! As instructed from the rider briefings, we pressed the SOS button on our race trackers and waited for assistance. Riders that passed us asked if we were Ok, we said “no” and frustratingly, no-one actually stopped. Finally, I told passers-by that they should report our situation to the next marshal and we needed help at the 22.5km mark from the start of the stage. After 30mins of waiting, we decided I should ride back to the last marshal and sort it from there. In just 2k I found a doctor but he was busy with another rider and couldn’t leave them but that a second doctor had been dispatched to us. Finally, I told him our location and I returned to Angi back on the trail. The pain of the crash for Angi was getting worse and we hoped the doctor would arrive as soon as possible. It was another 30 minutes and over an hour after her crash that the doctor arrived and almost drove past us. After arranging to get Angi transported off the trail and her bike recovered, I went on alone to finish the stage. After a break from full race to waiting over 90mins, my legs were very stiff. The more I cycled though, the better it was, they recovered and began to spin again. I rolled up to the field, sometimes waiting to overtake in a good place, then off again. There was a little respite in that I could enjoy the scenery and of course, it was a little warmer now some time had passed. At each feed zone I made a stop and there was really something going on … an incredible number of riders here, barely any getting through to the tables where the food and drink was! Freshly fed, I made my way to the finish. Again and again, the drivers wanted to know how Angi would be …. and it was nice to know they were interested. I actually arrived at the finish before Angi. She had endless waits in the outback, then the finish before hospital. Finally at 6pm she was back with me and luckily she hadn’t lost her laugh! I hope she heals quick and we can attend the EM in a months’ time. I think that will work and we have everything planned already!!!! The height profile today resembled a piece of corrugated iron, up and down …. the beginning was pretty boring around all the orchards and on asphalt or gravel. However, longer the race lasted the more singletrack it had. At the first long section of singletrack I had to queue up and after I could overtake Hielke and Cony. This singletrack trail was quite long, but also cool !! Back on a gravel road I joined up with Nina and Heinz, who were on the podium yesterday, and today they were good again in the race. So it went on and on, I worked my way forward, was thwarted again and again, but I really had a lot of fun. At some point I was pulled up and out of the back of Carmen / Samanta, they drove past like an express train (I was quite surprised). But as soon as they overtook me, they could not leave! So I drove after them, always respecting them with some distance, so I did not obstruct their race. Even if I quickly stopped in the feed zones, I caught up with them again, even in the area, which is not my strong point (but maybe I’m getting better and better ;-)). We rode together almost to the very end, actually I wanted to let them drive in front of me to the finish, but unfortunately they did not work so well together in the last 6km. I finally decided to risk the attack and so I kicked hard, and actually arrived in front of them at the finish. I really enjoyed it and felt good on the bike. My time is not bad either! Tomorrow will be another long day in the saddle … let’s see where I’ll start, but I am actually liking it in Block C I (the hustle and bustle was less crazy than in Block B and that feels better!). Today was the longest stage on the program at 122km! I do not like these stages, because they are mostly boring with little singletrack. Again I had to start in block C. Apparently the „fast ones“ of yesterday had moved up to block B or the riders had more respect for the long stage today. Anyway, it did not start as fast as yesterday. Only Soren drove us all away. So I sat down to the top and made the pace. It was raining slightly and as we headed in the „wrong“ direction, we had the wind from the front and the black clouds in the field of view. As expected, we rode into every field before it went into the first ascent, this was on a single trail and then the race came to a complete halt !! It was a „stop and go“ ….. then finally up, my glasses were so fogged that I could hardly see anything when descending. After a short „flat“ section, it went into the second climb, which was quite steep, but fortunately „two lanes“ so I knew everything was riding and people could overtake. Then we came to the hotspot, but of course with a little delay 😉 and on we went. Up and down, left and right …..
Like yesterday, I stopped at each of the „water points“ to refill bottles and take some salty food. During the 3rd meal I even used the “full service” 😉 Bidons change, eat 😉 oil and have glasses cleaned !!! I had a clear view! But then from km 80 it was tough to be alone, to work in the wind, and the miles did not want to disappear. Mirco was once again near me and with him two other men. Actually, I would have liked to Stretch out my legs a little but I knew if I did this, it takes forever to reach the finish. So I tried to follow them. But the many changes of direction did not make it any easier, because if you are behind in the series, you have to work to regain the wheel again and again! That costs strength every time! Anyway, I stayed with them more or less. Then on the last 20km we also had to ride through some sand fields, we just waited for that !! My legs turned, but my head had a lot more trouble getting through the race. This was really a struggle with my motivation today and yet I managed to bite hard and push through !! I do not know when it was last time that I was happy to ride the bike on the asphalt !! But today I did it. Then the last kilometers to the finish were the horror, the men gathered all their forces again and I had a lot of trouble not to fall out of the slipstream !! Finally the last kilometer and it was done! At the finish I was welcomed by Nicole, Angi, M.T and Morne and to celebrate the day there was pizza !! Also, Jennie stopped by, that was cool ! !